Kazan Tennis Academy hosted the VI Annual Republican Iftar which gathered thousands of fasting believers from all over the Tatarstan and beyond. The mass event was attended by members of the Tatarstani Government, MPs, Consuls of foreign countries, religious figures of Tatarstan and other Russian regions, representatives of the Orthodox and Catholic clergy, as well as socially unprotected layers of the population (large and low-income families, people with disabilities). In addition, the President of Tatarstan Rustam Minnikhanov also honored the iftar with his presence. To ensure the security of the VI Republican Iftar, some 15 metal detectors were installed on the territory of the Kazan Tennis Academy, with 120 stewards, 30 representatives of the private security firms, 2 ambulance brigades and Interior Ministry staff being mobilised. Another 367 volunteers aged 16 and above were recruited to meet Iftar guests, organize collective prayers, serve meals and clean up on the first day of Iftar. A significant part of the guests of the Mejlis were Muslims from the regions of the republic. A total of 1000 people are expected to take part in the two-day iftar. Delegations from the regions arrived at a sports facility in Kazan by specially organized transport by 6 pm. Arriving guests were pleased with live performances of Nashid and munajats by State Ensemble of Folklore Music of the Republic of Tatarstan and ensemble "Saf". 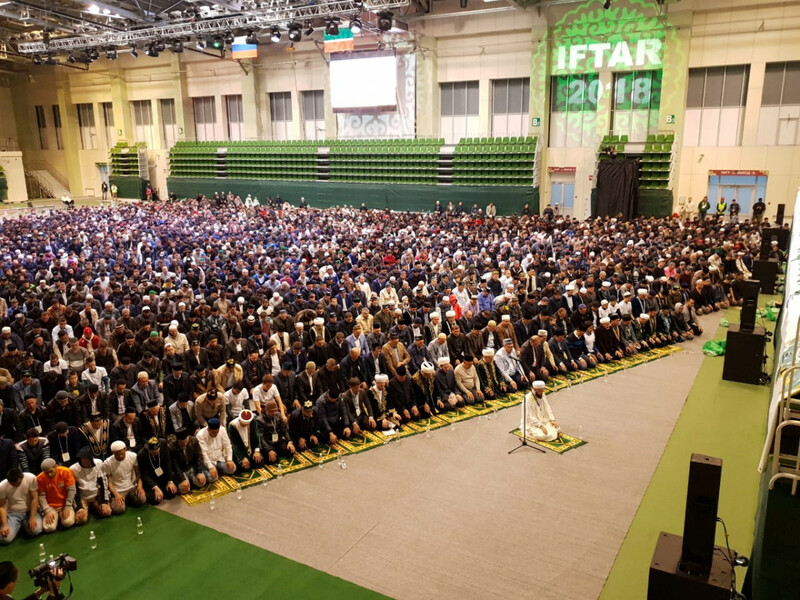 With the onset of the time of iftar, the participants performed collective prayer-namaz headed by the Mufti of the Republic Kamil Hazrat Samigullin. After the prayer of all, without exception, guests were ushered to dinner tables covered with pilaf, fruits, juices, ochpochmak, becken, chak-chak, candy and biscuits. Some 1,100 tons of meat (beef), 600 kg of rice, 1.2 tons of vegetables, 2 tons of fruits, 800 kg of dried fruits, 8000 bars of chak-chak, 2000 liters of juice and 7000 liters of bottled water were purchased for cooking. Immediately after the iftar the Mufti of Tatarstan Kamil Hazrat Samigullin and the President of Tatarstan Rustam Minnikhanov gave interview to reporters. The head of the republic reminded that he, on orders from the Russian President Vladimir Putin, heads the Group of Strategic Vision "Russia-Islamic World" and noted the active cooperation of Tatarstan with the Islamic world, recalling in particular the recent Kazansummit-2018 international forum in Kazan, attended by many countries of the Islamic world. Kamil Hazrat Samigullin, in his turn, stressed that "the republican iftar is called upon to unite the Ummah, Tatarstanians and our hearts. You could see that representatives of other faiths came to us, this really unites us, and thats how we live in Tatarstan."